In the healing of a man with leprosy, we see the touch of Jesus and new life promised to us through the Spirit's resurrection power. Today is Resurrection Sunday — the first Sunday after Passover and the day Jesus rose from the dead nearly two thousand years ago. Today is our day to celebrate life, hope, joy, future, and reunion. You will likely hear today about Jesus' resurrection and what it means for us. In addition to all you hear about Jesus' resurrection, I want to remind you of something different, yet very much connected to Jesus' resurrection. His resurrection means that he can give us our lives back in the middle of our worst times. Jesus has the power to bring life to what feels dead, diseased, failed, addicted, forgotten, broken, or afflicted. The power of Jesus' resurrection is unleashed every time we ask Jesus to enter our world and use the Holy Spirit to make us alive to the Lord and his work in our lives (Ephesians 3:14-21). Our Fellow Traveler held his breath hoping to contain hope for a few last seconds before the expected bad news was revealed by the priest. In that nanosecond of waiting, his mind raced through the worries of the past few days. If the priest says that I have it, then my life is over! There's nothing left but to choose a few things to wear and find a mat I can use for sleep and to beg. I will lose everything else. I will have to give up my house, my family, my friends, and my synagogue. I will lose my job and my ability to provide for my family. I will lose my identity and my place in the community. I will lose the touch of my friends, my family, my children, and my wife. I will be a living corpse awaiting the inevitable. Please God, don't let it be so! Please God, spare me the indignity, isolation, and the waiting around to die alone. Please save me from being worthless to my family, a burden to myself, and left out of any kind of life worth living. O God, hear my cry as I pray that I don't have to live in the putrifying stench of my own body as it decays and rots with infection. Please, God of Abraham, Isaac, and Jacob, hear my cry for help! "Yes, I'm sorry, but it is leprosy." I'm sorry my friend, but you must be put outside the community, and you must stay away from everyone. It is for the good of the community, and it is the will of God. For our Fellow Traveler, the days ran together while nights never seem to end. The stench and the rot of his own flesh would always be with him, but often they were overwhelmed by the tidal wave of incessant hunger, fever, and pain. But being "put out" and forced into a sub-human existence on the fringes of life is the worst pain of all. I bet those who throw me their discarded bits of moldy and stale bread don't know how badly it hurts to be alone and left untouched until I die? Such thoughts brought tears to our Fellow Traveler's eyes and they rested like a heavy weight upon his heart. Little could our Traveler imagine that one simple interchange with Jesus was about to change everything. At first, our Fellow Traveler saw only a small stirring of dust on the horizon. Then he heard mingled voices in the distance. The were the teaching conversation of Jesus and his disciples as they approached the outskirts of the Fellow Traveler's small village. He has heard of the Nazarene, Jesus, the one some called the Messiach, the Christ and God's Messiah. Now he would be able to meet Jesus for the first time. Long before this day, our Fellow Traveler had given up the Law-mandated warning he was to give to folks as they approached. He assumed that his filthy rags called clothes, the stench of his decaying body, the grotesque changes in his appendages, and his isolation outside the village said all that needed to be said: "Leper! Leper! Leper! Steer clear of the unclean leper! Stay far away from me; I am unclean and to be avoided at all cost!" Jesus was powerfully moved. 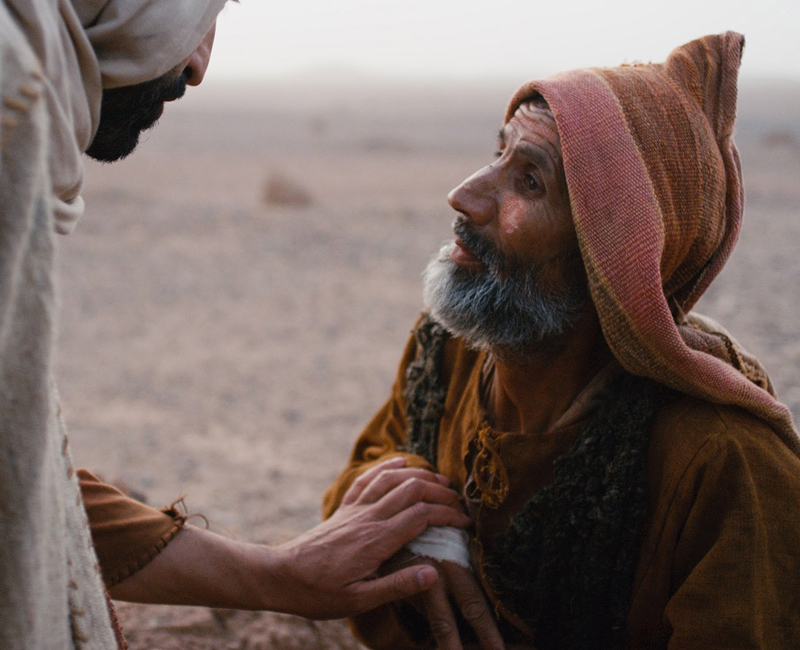 He reached out and actually touched the leper. I do want to. Be clean. And at that very moment, the disease left him; the leper was cleansed and made whole once again. Miraculously, Jesus reversed the polarity of holiness and uncleanness. Our Fellow Traveler was as shocked as he was delighted. Everything happened so quickly and so simply. He asked, and Jesus granted him more than he knew to ask. Of course, he was delighted to be healed. He rejoiced as life returned to a physical form quickly failing him. He celebrated as wholeness returned to a body rotting with decay. He was overwhelmed with relief and anticipation knowing he could return home to his family and to his way of life. But the touch happened so quickly, so naturally, and so tenderly. It was our Traveler's first touch after being avoided and shunned for so long. That touch was a moment of grace, a bridge built by Jesus for our Fellow Traveler to cross and leave his isolation. 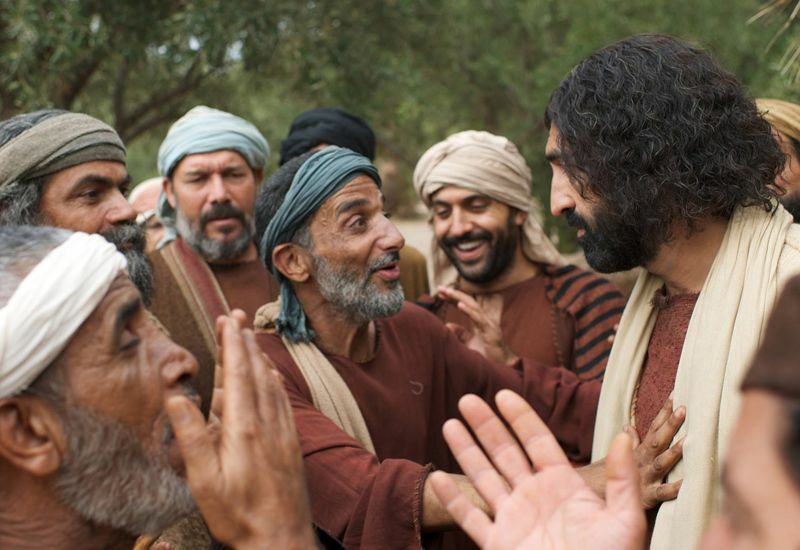 Jesus' touch was a simple and personal gesture of grace from God's Messiach. It gave him back his identity and provided him reasons for significance. To everyone else, Jesus' touch was shocking! Such a touch was unlawful! It was supposed to be corrupting to the "toucher" because of the uncleanness of the one touched. However, Jesus reached out and actually touched the leper. Miraculously, Messiach reversed the polarity of holiness and uncleanness. The touch of Jesus cleansed the unclean instead of corruption of the unclean defiling Jesus. The Messiach's touch brought life, cleansing, and hope to an unclean man caught in the grip of fleshly decay — a body with leprosy destined to die. Jesus' Passion can mean much the same for you and me. In the middle of our mess, our decay, our isolation, our self-loathing, our doubts and our incapacities, Jesus reached out and touched us in the middle of our mess. He shared our humanity. He bore the brunt of our broken world to make God real and reachable. Jesus' touch made true life, eternal life, accessible to us in the stench of our mortal flesh destined for decay. Since we, the children, are all creatures of flesh and blood, Jesus took on flesh and blood, so that by dying He could destroy the one who held power over death — the devil — and destroy the fear of death that has always held people. ... He had to become as human as His sisters and brothers so that when the time came, He could ... help us when we are tested (Hebrew 2:14-18). He emerged victorious, without failing God. So let us step boldly to the throne of grace, where we can find mercy and grace to help when we need it most (Hebrews 4:15-16). It's Resurrection Sunday! Let's celebrate Jesus, our Messiach! He has touched us in our brokenness in the cross and the tomb. He has given us new life and raised us from death and decay through his resurrection. Our hope for God's future, our being healed, and the reclamation of our lost lives are no less redeemed from futility and loss than was the man with leprosy. Our world has received the touch of Jesus. We have received his touch. We have been comforted by the presence of God among us. The polarity of sin and death have been reversed so that corruption and decay are swallowed up in the promise of life. We have been raised back to life by the same power that raised Jesus from the dead. Praise be to the God and Father of our Lord Jesus Christ! In his great mercy he has given us new birth into a living hope through the resurrection of Jesus Christ from the dead, and into an inheritance that can never perish, spoil or fade (1 Peter 1:3-4). [THEVOICE] For this series, unless otherwise indicated, the Bible verses will come from The Voice translation. The references are also linked to the NIV for comparison. Special thanks for Free Bible Images and The Lumo Project for the use of the images in this post. "Raised" by Phil Ware is licensed under a Creative Commons License. Heartlight encourages you to share this material with others in church bulletins, personal emails, and other non-commercial uses. Please see our Usage Guidelines for more information.